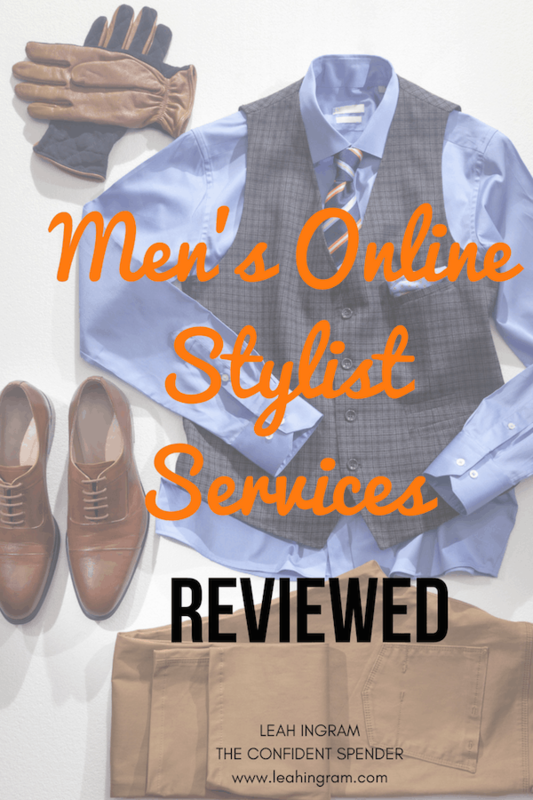 Portions of this article on men’s online stylist services first appeared on Parade.com. It’s been updated since I first wrote this article in 2016, including with the following new information, broken out by brand, about subscription boxes for guys. Stitch Fix now allows you to make exchanges for clothing that doesn’t fit. You can purchase gift cards for the man in your life who might benefit from Stitch Fix for Men. Stitch Fix Gift Cards starts at $20 and up. Choose from one of the pre-set amounts or set your own. Pick what works for you! 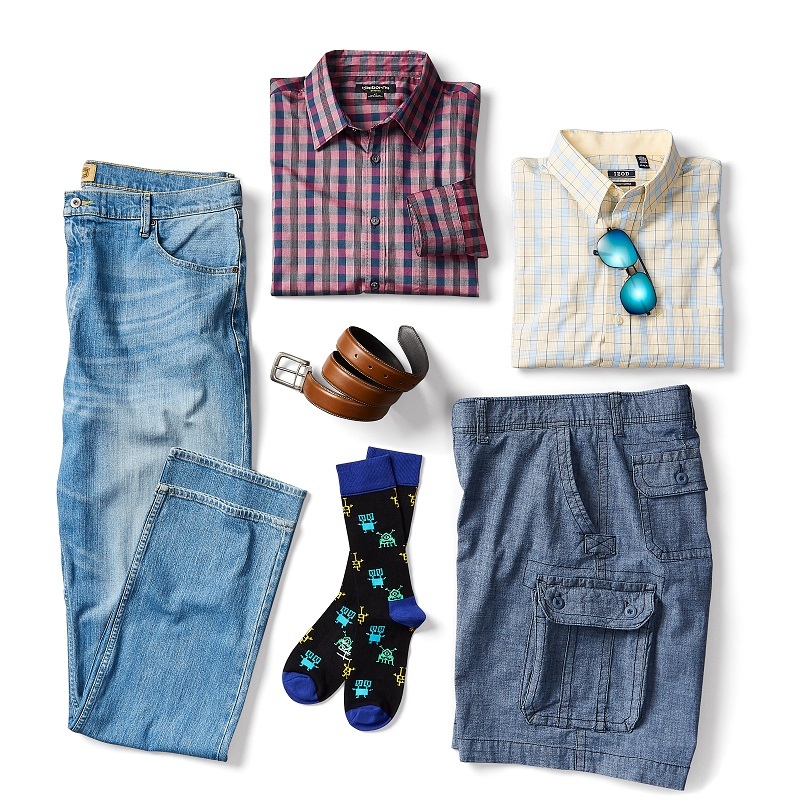 Finally, Stitch Fix Men, the men’s fashion box, offers extended sizes–including big and tall. 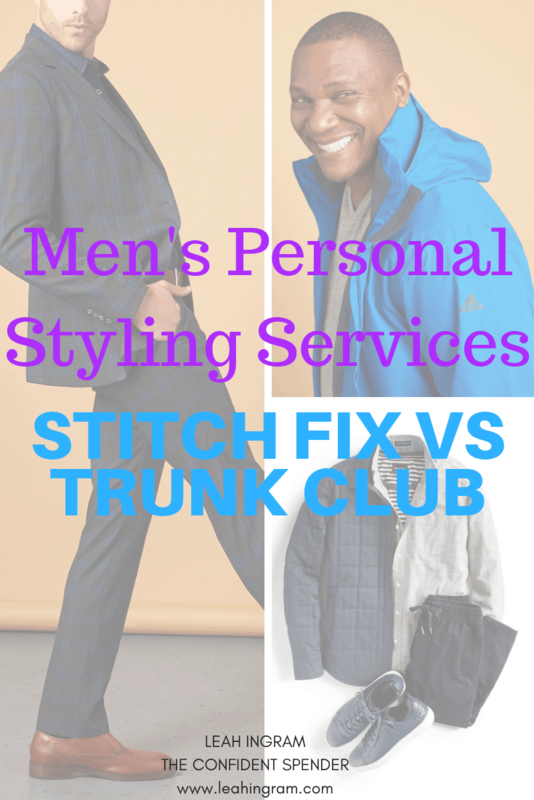 Here is my new Stitch Fix Men review, focusing on it as a big and tall subscription box. Trunk Club will waive your styling fee if you’re a Nordstrom Card holder. So styling is now free. Bombfell is a new-to-me men’s online styling service. My husband recently received his first box and I’ve added that review below. The company is constantly introducing must-have brands. Most recently it added Barbour to the mix. Barbour has a storied history dating back to 1894, is an outfitter of the Royal Family. Barbour is known for its outerwear designed to withstand the gloomy weather of the North Sea. Request one in your next shipment (and quickly because supplies are limited) to add a touch of British-country-gentleman to your closet. My original review on subscription boxes for guys included Men’s Style Lab, but Men’s Style Lab has closed down. This Des Moines news story reported how the business was on the verge of shutting down after getting scammed by customers. It looked like it actually happened and this online stylist service bit the dust. Now when you click on the URL, it goes nowhere. So you’ll see a bunch of text below crossed out to reflect this update. Now onto the original article. One of the reasons I like online stylist services is that I find them to be a great value for your time and money. That is, they’re great if you’re too busy to go to the store. Or they fill a need if you feel you don’t have the acumen to choose on-trend clothes for yourself. These services will do that for you. And for a nominal fee. 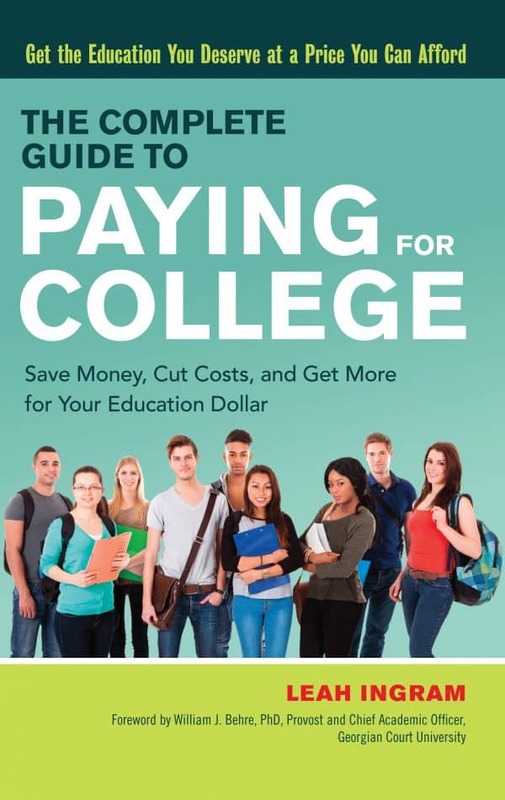 Most are only $20, on average. That $20 is deducted from the cost of anything you buy from your subscription box. These clothing subscription services are hugely popular. One survey I saw said that orders for subscription box services jumped 83 percent on Black Friday/Cyber Monday over the past year. Of course, these numbers are for all subscription boxes. These boxes includes Dollar Shave Club (which are razors and which I covered in this 2013 blog post), Birchbox (cosmetics) and Bark Box (dog goodies), among others. 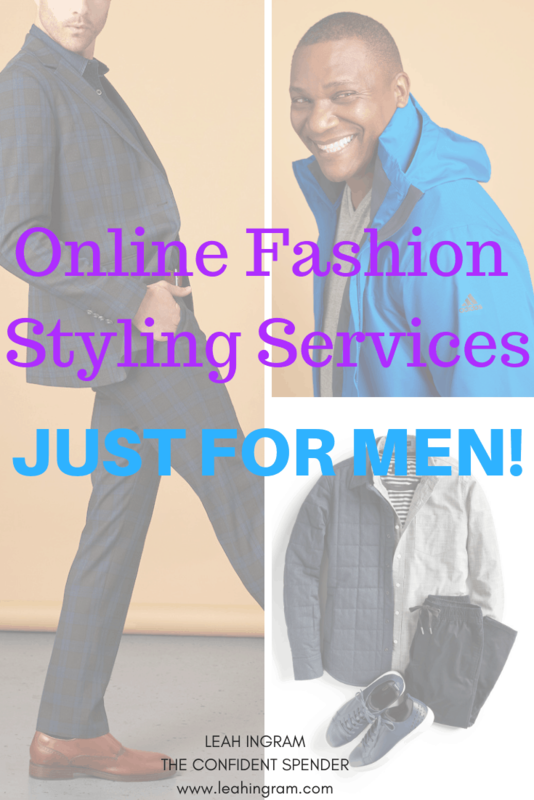 This story is just focusing on three men’s online clothing styling services for now. So it’s Stitch Fix vs Trunk Club vs Bombfell. 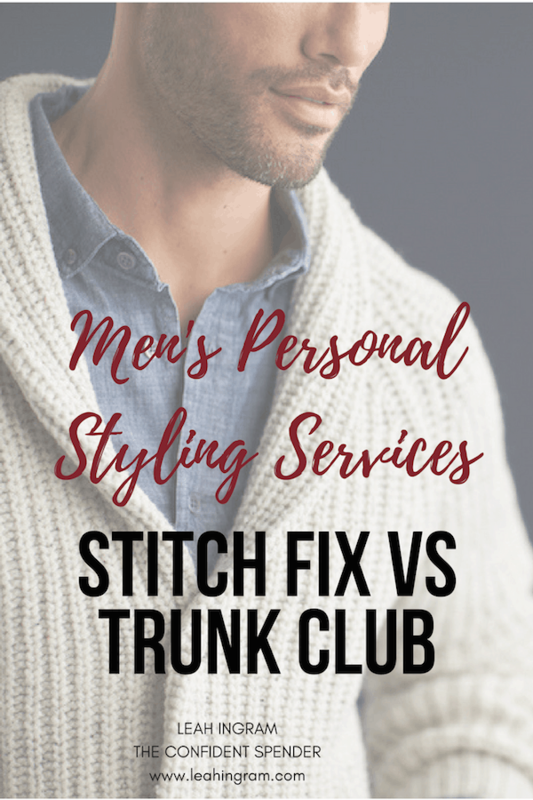 It’s important to note that Trunk Club and Stitch Fix are is for “regular” sized men only. I say this because I would have loved to have used my husband as my guinea pig for all of the men’s clothing subscription services covered in this review. However, at 6’3″ and a former football player, the clothing was neither big nor tall enough for him. That’s why I was thrilled to find Bombfell. They have big-and-tall clothing options. Note to companies selling clothing subscriptions for men: take a page from Dia&Co and start a service for “big and tall men”. Great news–in September 2018 Stitch Fix Men started offering extended sizes. This is great since Stitch Fix debuted plus-size clothing for women in 2017. Men with hard-t0-fit feet should check out extended-size options on Zappos. It’s where my husband buys all of his shoes. Have you checked out the most popular subscription boxes by location? Where does your state rank? Stitch Fix Men launched in Fall 2016. The personalized styling service offers men a wide range of apparel, footwear and accessories like socks and belts. Some of the brands Stitch Fix Men is sending include Scotch and Soda, AG, 7 For All Mankind, Penguin and Mavi. Sizes range from XS through XXL, waist sizes 28-42, and inseams 30, 32 and 34. Like Stitch Fix for women, men sign up for online stylist services by filling out a style profile to share their size and style preferences. A personal stylist selects five items of apparel, footwear and accessories that best fit his unique taste, budget and lifestyle. The items are shipped right to his door. He has three days to try on his Fix at home. He buys what he wants by checking out on the Stitch Fix website or the Smartphone app. Then, he sends the rest back with free shipping both ways. There is a $20 styling fee that is deducted from the price of whatever you buy. I had my 30-year-old brother Josh Ingram, a brand strategist in New York City, test out Stitch Fix Men. Josh normally shops for clothes at H&M, J.Crew or the skate shops in his hip Williamsburg, Brooklyn neighborhood. Sometimes he’ll buy clothes online because he likes instant gratification. He’s never worked with a personal stylist before. As mentioned Josh found the sign up and style profile creation process for Stitch Fix Men easy and clear. When his Fix finally arrived, it was spot on. “They did a pretty good job, actually really good. The stuff they chose was quality and really solid. It was really customized,” Josh says. His Fix included two shirts, a belt, a pair of pants and a sweater. He was impressed with the packaging inside the box. Josh liked the styling cards that come with each Fix. He found the suggestions on how to wear your items with other products helpful. What about giving the man in your life a Stitch Fix gift card for Father’s Day, his birthday or as a holiday gift? Also, Josh didn’t feel like three days was enough time to try everything on and send it back. And, because he lives in New York City, where outgoing mailboxes are uncommon in apartment buildings, having to walk the Stitch Fix return package to a post office was a hassle. So what was Josh’s takeaway from Stitch Fix Men? Well, he loved the belt so much he kept it. “It was really unique,” he says. “The color of the leather was really nice, a beautiful cream brown.” But he did send the other four pieces back. He’s not sure he would use the service again. A big part of this is because mailing things isn’t always convenient. I imagine that if Josh had lived in a private house, a doorman building or the suburbs with a car, his opinion of the convenience of Stitch Fix Men may have been radically different. Stitch Fix now offers “Extras” for men. That is you can add basics, like underwear, undershirts and socks to any Fix you schedule. Finally, Stitch Fix Men just announced that it is expanding into new categories and sizes to deliver personalized fit and size for every guy’s wardrobe needs. Even though Stitch Fix Men has been around for just two years, this feels like a long time coming. Have you ready my new Stitch Fix Men review? It focuses on it as a big and tall subscription box. In 2016, Stitch Fix Men launched with 50 brands, and 160 fit and size combinations. Now, Stitch Fix Men will offer more than 100 brands, and 800 fit and size combinations. This includes Stitch Fix exclusive brands as well as those you recognize from traditional online and brick-and-mortar stores. These offerings will be across a wide spectrum of styles to deliver the most personalized shopping experience for every male client. In layman’s terms, this means that Stitch Fix Men will now carry sizing options up to 3X in tops, and pants in sizes 28 wide x 28 long to 48 wide x 36 long. So it’s not just the big-and-tall men that will benefit—petite men will finally have online styling options, too. Trunk Club for Men started in 2009 in Chicago. In 2014, Nordstrom purchased the company. Trunk Club added women’s clothing in 2015. 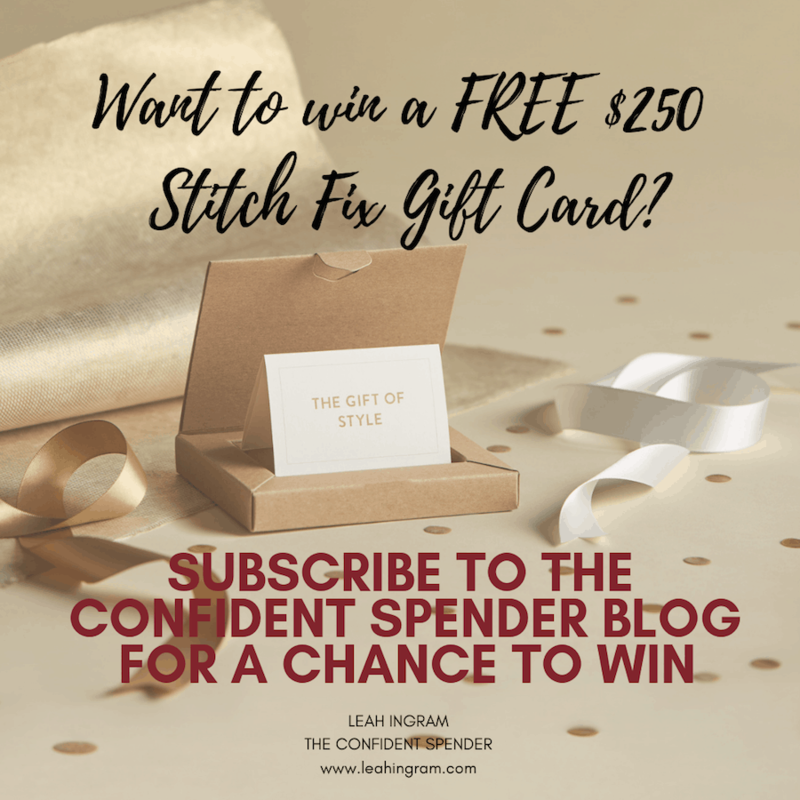 If you read my review of Stitch Fix vs Trunk Club for women, I’d mentioned that I liked the Nordstrom connection. As a devout Nordstrom customer, I was familiar and comfortable with the quality of clothing the store sells and the level of customer service it offers. Trunk Club hasn’t let me down in either of those areas. 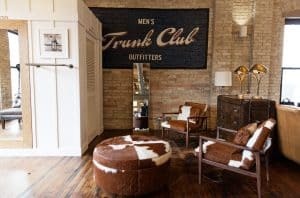 In addition to its clothing club for men, Trunk Club offers in-person personal styling services if you visit one of the Trunk Club Clubhouses in Boston’s Back Bay, Chicago, Dallas, Washington, D.C., Los Angeles, New York and Charleston, S.C. The Clubhouse services both men and women. At the Clubhouse you can have custom clothing made—something not offered through the subscription service. In fact, because my husband is considered to be big and tall, if he wanted Trunk Club clothing, he would have to get them through an in-person appointment at a Clubhouse for custom-made shirts, casual jackets or business suits. Because of my husband’s size, I had to find another surrogate man for this review. Meet Eric Bruun, 48, of Carmel, Indiana, a private equity investor and single father. Eric’s actually been a Trunk Club customer since 2012. Eric loved the personal touch, and the clothing was pretty great. He received 10 pieces and had five days to try everything on. He was hooked. In the beginning, as he was building his wardrobe, he received a Trunk every month or so. Nowadays, he’ll order a seasonal Trunk. That is, unless he has a special occasion or needs something to wear for an upcoming event. 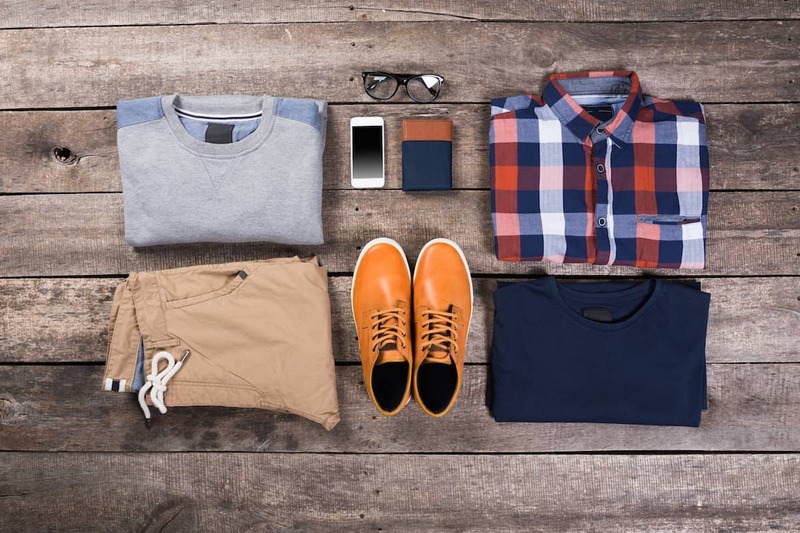 As a busy businessman who travels a great deal of time, having online stylist services send him a clothing box when he wants clothes has made life that much easier. While clearly a huge Trunk Club fan, Eric wishes there were better options with the belts they send. “I think Trunk Club has an opportunity to increase the selection of accessories they offer,” he says. Interestingly, he feels like he doesn’t hear from this online styling service nearly enough. He would like style updates sent regularly to spark him to contact Lisa about new clothes. Also, Trunk Club initially did not have a styling fee. Now it charges $25. However, if you have a Nordstrom VISA Card, Trunk Club will waive the personal stylist fees. Like other personal styling services that charge a fee, Trunk Club deducts that from the cost of any clothing you buy. Not only does Eric enjoy the ease of working with his stylist, he also finds the checkout process and shipping back of clothes to be easy. Trunk Club provides a return UPS label with every Trunk. You can drop your Trunk at a UPS Store or arrange to have UPS pick it up from your home. Sounds like I’m definitely going to have to get my husband an appointment at a Clubhouse. The gift of custom clothing might just be the perfect holiday, birthday or anniversary present to give him. You might want to give this to a man who has always wanted to work with a personal stylist but didn’t know how to go about doing that. In reading other reviews of this online stylist service, it seems Bombfell has been around for a few years. And, for the most part, these reviews have been positive. Most men referenced other styling services that did not listen to their feedback for their reason for joining Bombfell. Others said they felt like they were in a fashion rut and needed some help getting out of it. Bombfell seemed to be the antidote. Bombfell was super easy to sign up with, and filling out the style profile was, too. Look at some pictures, click some buttons, tell them what brands you currently wear, add in your measurements, done. While Bombfell doesn’t share, in an obvious place, the brands it has at its disposal, those aforementioned reviews talk about Mavi jeans, Penguin shirts and French Connection separates. In my husband’s first men’s fashion box, he received two items from Tommy Bahama, a brand I recognize. The other brands were Greek to me. Like other online styling services, Bombfell sends you five items to try on and decide if you like. You have seven days to checkout and send items back. Otherwise, you will be charged for all of the pieces. Your box comes with a package for sending everything back–assuming you’re not keeping everything. Everything you do when dealing with a Bombfell is done via its website. Bombfell does not have a Smartphone app. You can preview–and edit–the clothes your stylist has selected for you before they are shipped. Like the other men’s and women’s subscription styling services I’ve covered, Bombfell charges a $20 styling fee for each order. That $20 is deducted from the total of whatever you buy. Send everything back? You’re out the $20. With a long torso and shorter legs, the shirt and jacket fit great and the shorts were perfect. The only problem Bill had was the inseam on the pants and jeans. But that was because of the information he’d shared in his style profile. Bombfell only offered “even” inseam lengths. Bill is really a 33. So rather than risk a 32 being too short, he chose 34. The 34s were way too long. So we now we’ve updated his profile to ask for 32 length pants. We tried to exchange the pants for a 32 but they were all sold out. Bill was pleasantly surprised at how much he liked nearly everything the stylist sent. 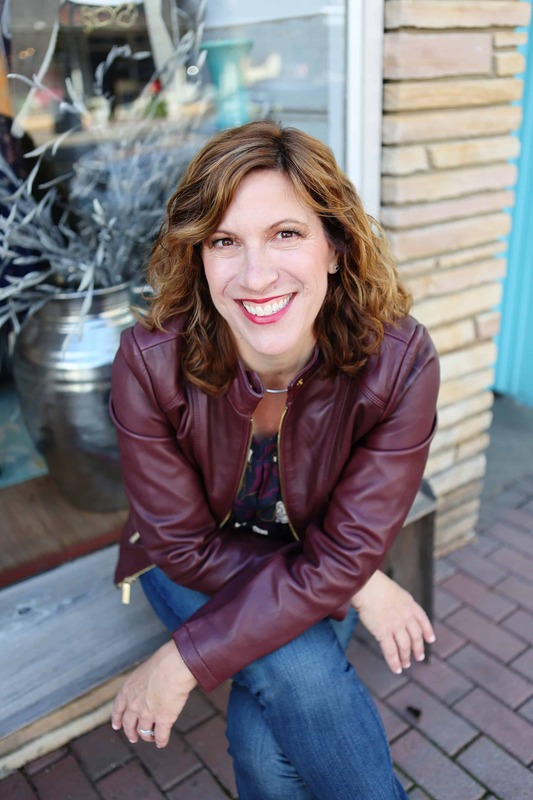 Like me, when I first tried out online stylist services for women, I was skeptical that anything would work for me. But, also like me, he ended up keeping something that he never would have bought for himself–the slub knit jacket in a dark navy. Heck, the jacket was something he never would have even taken off the shelf in the store. So Bombfell, with this one item, took him out of his fashion comfort zone, slightly, and it was a huge win. If they had fit, the pants would have been a winner, too. The same sort of bug happened during check out. He found the checkout process to be a lot less intuitive than he expected. At times it was confusing which button to click to finalize check out. Eventually, though, he got it right. It was really hard to reach customer service. In fact, there is no phone number on the website or paperwork that came with the clothes. What appears to be a chat box on the bottom right-hand corner of the Bombfell website is just a knowledge base. When Bill had a question about how to exchange the twill pants he loved, emails went unanswered as did tweets. Finally, messaging Bombfell via their Facebook page was the magic bullet for getting the answers we needed. FYI, you can make exchanges during checkout. The site’s FAQ should really spell this out. Update: Bombfell let me know that there was a bug in the system the day we tried to reach them. Bombfell ships via FedEx and that’s how you return your items, too. It tells you repeatedly not to use a FedEx drop box, because then the package can’t be tracked. However, you do have the option of sending back USPS but you have to email customer service to get your USPS label. In my opinion there should be a dropdown option during checkout that let’s you choose to print your free label from FedEx or USPS. You shouldn’t have to email and then wait for Bombfell to reply. I hope they change this in the future. Bill was pleasantly surprised at how well everything fit and how nice the clothes were. But my miser husband had a hard time paying $100 for shorts when he’d just bought a pair, on sale, at JoS.A.Bank for $39. The jacket he kept is like nothing in his wardrobe. He would have loved to have kept the gray twill pants from the fashion box–and was already mixing and matching them with items in his closet while we waited to hear from customer service. However, it was not meant to be. Again, the pants being too long is our bad, not Bombfell’s. We have since updated Bill’s profile with a shorter inseam so the next time, his pants won’t be too long. Also, when we tried to update his style profile budget to something a bit cheaper, he discovered that he had chosen the cheapest range already. So there is always the chance he could get $100 shorts in a future fashion box. Even with the customer service snafus, Bill says he would consider using Bombfell again, especially if he had a special occasion for which he needed new clothes. Also, he’s about to start a new job that will have him working 60-80 hours a week. I think having an online stylist sending him clothes is going to fit his new professional lifestyle much better. I mean, I’m not going clothes shopping for him. When, for just $20, we can hire someone to do the shopping for him and the clothes show up on our doorstep and we can ship them back for free, why wouldn’t we use Bombfell? It’s like having a personal stylist on a budget and on call whenever you need them. If this sounds good to you, sign up now. 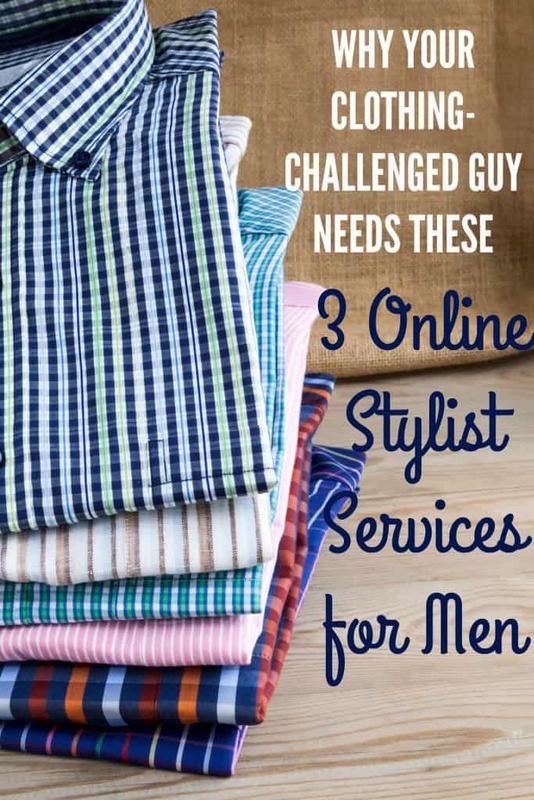 For anyone who has a tough-to-buy-for-guy in their life, one of these men’s online stylist services might just be the perfect gift to give for the holidays, Valentine’s Day, his birthday, Father’s Day college graduation or another occasion for which you will be buying your favorite guy a gift. Whether you decide that Stitch Fix vs Trunk Club vs Bombfell is the best clothing subscription box for men is based on what you’ve read here and what resonates with you. My son received Stitch Fix and loved it. I loved the prices. He is now too big for the kids line. In reading this review it appears Stitch Fix is the best regarding prices for men. Would you agree?